We all deserve to feel confident in our jeans. But when you're insecure about your midsection, confidence doesn't always come naturally. The right fit jeans will accentuate your best features and enhance your figure without drawing attention to a fuller midsection. Boot-cut jeans can bring balance to thicker midsections, notes stylist Stacy London. Similarly, flare jeans flare out from the knee to the ankle, so the width of the jeans distracts from the stomach area. Wide-legged jeans flare out the entire length of the jean, creating a silhouette that distracts from the tummy. Choose styles that offer a little stretch to help hold in your stomach. Despite what the name implies, you don't need to feel skinny to wear skinny jeans. According to Fran Kauchner, style expert at plus-size retailer Silhouettes, you can wear still skinny legs if you're looking to hide your stomach area. Choose a dark rinse and emphasize your waist in some way, notes Kauchner. If you're concerned that the skinny leg will draw attention to a larger mid-section, balance out your silhouette by pairing skinny jeans with a mid-length or knee-high boots. Tummy control or tummy tuck jeans feature sewn-in shapewear at the front of the jeans to hide the stomach area, and enhance and contour the figure. When deciding which brand of tummy control jeans are best for you, remember that comfort is key. If you feel that your stomach is constrained by the jeans' elastic stretch or is spilling over the waistband, consider sizing up. 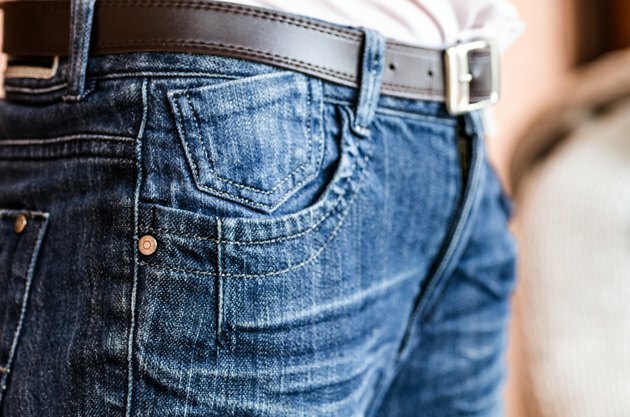 If your stomach feels comfortably held in by the jeans, it is most likely a good fit. London advises women who want to hide the stomach area to look for mid-rise jeans and to make sure that the jean hits right at the stomach area, below the waist but above the hips. A mid rise should allow the jeans to comfortably hold in and hide your stomach without causing pinching or unsightly tummy bulge. Consider jeans that zip or button at the side to avoid adding extra bulk to the front section of your jeans. Pairing jeans with long blouses that cover your hips will flatter your figure and hide your tummy. Avoid low-rise jeans and hip-hugging jeans, which typically allow any stomach bulge to spill over the sides of the jeans. Jeans that are too tight may create the dreaded "muffin top" look, causing any belly excess to spill over the sides, and draw attention to the area.